This time it’s a single cask from the Speyside region, but which distillery? We don’t know, it’s a secret, or a Toya once said a mystery, either way it’s 20 years old. Price: £65 for a 70cl bottle and available here. Little can be revealed about this distillery and its specific location for legal reasons. Only the cask details and Whisky region are permitted to be confirmed for this exquisite example of a Speyside whisky. This Single Malt Speyside Whisky was distilled on the 17th of October 1994 and aged in a refill Bourbon hogshead, cask number 1171. Bottled at cask strength with no colourings added – this is non-chill filtered. You will enjoy soft fruits such as melon, peach with hints of pineapple on the palate and nose. With a little water you can bring out a gentle sweetness of lemon pie flavour. In the aftertaste you can find the hint of mint toffee. 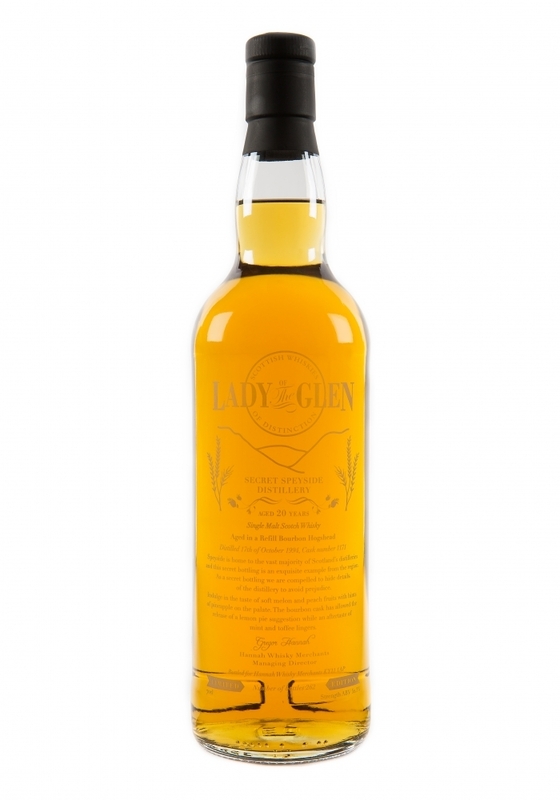 Your limited edition bottle is presented in the Lady of the Glen bespoke gift bag with a descriptive tasting tag and delivery is included in the price. A secret distillery, how exciting, as yet we’ve really enjoyed everything that Lady of the Glen have released so far, it’s always been a joy to sample. So we have high hopes for this, so less talking and more drinking! Soft dirt, dust and warm tumble dryer lint, and a hint of tea chests in an old loft with layers upon layers of yellowing, ageing lace. There is sweet warm hay, and coconut husk and just a touch of Madeira cake. There is soft fruits, sticky perfumed lychees coupled with mandarin and donut peaches (if you have never tried this variety of peach, you seriously should). There’s hints of fresh basil and mint, with cedar wood lurking in the background. There’s a lovely warming spiciness to this, that isn’t found on the palate. Definitely a chilli and ginger tingle. This soon dissipates leaving just the warmth in your chest. There are sticky warm fudge notes with chocolate, but it’s a dark chocolate, not quite bitter, but it stops the fudge notes transferring the full amount of sweetness they may otherwise have. This is a good thing as it was all becoming just a little too sweet. There are vanilla sponge notes and the sweet yet sour notes of evaporated milk, with coconut ice quickly following. The fruits start to make themselves known, it’s all very soft, the peaches are gentle and there are some soft, ripe red apples in the mix too and then hot pineapple char grilled and drizzled with honey. The mustiness is still present, and a slight root vegetable note with sweet parsnips and baby carrots is also there. As this continues to open up in the glass there is soya milk and mint, a strange combination but undeniable, before fresh raspberries, cranberries and red currants make their entrance and steal the show. Mouth coatingly sweet, with the mint and basil fighting against the fruits for recognition, as the whisky starts to leave there is sweetness and for me that little bit of mustiness continues, almost fighting against the sugared notes. An interesting whisky, complex, with a fantastic sweetness and beautiful, palate challenging array of fruits. I like the almost perfumed nature of this, and I love how mint and basil not only change the direction of this, but take it from perhaps ordinary to something more. The musty note never really leaves, and if anything at times it’s overpowering reducing the enjoyment factor for me, however on the nose I really enjoyed that note. It’s one that I would happily drink, and at the price, it’s reasonable. I’m not won over entirely yet, this is one whisky that really makes me think but the more I nose and taste it, the more enjoyable it becomes. Definitely worth a try. Aromatic chocolate sweets, freshly squeezed lime juice coupled with a beautiful hit of warm bread. Next up comes some boiled milk, just cooling on the hob. Oranges, redcurrants and blackberries give this a fruity tang. Beautifully warm with a lot of spice to begin with, the spice soon leaves and the fruitiness from the nose hits home with the aforementioned berries coating your tongue. Sumptuous taste of warm bread make this a rather homely dram. Very fruity with the lime juice just rolling on, giving it a long finish. Gorgeous dram, really fruity and excellent value for money, this is a great example of somebody knowing how to pick a cask. Wonderful. A big thank you to Gregor Hannah of Lady of the Glen (@LotGWhisky) for our sample and the request to review, a pleasure as always.